Wyatt Earp remembers. When Wyatt Earp and his brothers arrived in Tombstone, Arizona, in the 1880s, he was a respected young lawman. When he left, a short time later, he was a fugitive. Tombstone had broken and wounded Earp and his family, and changed his life forever. Here is the story of Wyatt Earp's life, both the triumph and tragedy, powerfully told by western novelist Richard S. Wheeler. The Gunfight at the OK Corral and its aftermath were the tragedies that transformed Wyatt and turned him into an American legend. In this biographical novel the lawman comes powerfully alive in what may be Richard Wheeler's finest novel of the West. 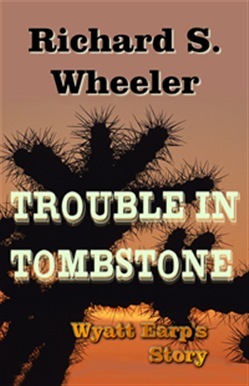 Acquista Trouble in Tombstone in Epub: dopo aver letto l’ebook Trouble in Tombstone di Richard S. Wheeler ti invitiamo a lasciarci una Recensione qui sotto: sarà utile agli utenti che non abbiano ancora letto questo libro e che vogliano avere delle opinioni altrui. L’opinione su di un libro è molto soggettiva e per questo leggere eventuali recensioni negative non ci dovrà frenare dall’acquisto, anzi dovrà spingerci ad acquistare il libro in fretta per poter dire la nostra ed eventualmente smentire quanto commentato da altri, contribuendo ad arricchire più possibile i commenti e dare sempre più spunti di confronto al pubblico online.